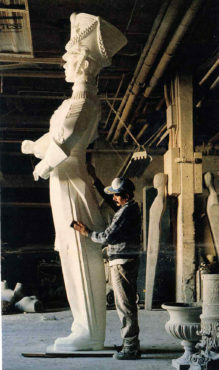 We Are Different | Public Art Installations |Venue Arts, Inc.
Venue Arts, under the direction of Stephen Stefanou, represents over 40-years of design experience. We specialize in creating custom ‘must-see’ destinations that are based on an understanding of the marketing objectives of the Client’s management team, the budget and the architectural direction of the property. Often times, we recommend designs outside of the traditional forms with the intention of creating a regional icon. Our designs are built with a 10-year+ life in mind. Our client list is quite varied to include corporate world headquarters, entertainment venues, municipalities, shopping venues, resorts and casinos. New York’s iconic Rockefeller Center at 1251 Avenue of the Americas and Las Vegas’ Bellagio Resort & Casino are two of our more notable and popular US destinations. 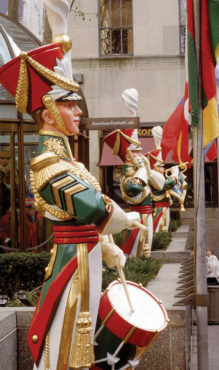 At Rockefeller Center, Venue Arts’ six hand-sculpted and hand-painted 10.5’H cadets have been delighting visitors every holiday season since 1989, dressed in full regalia and standing at attention on the popular skating rink surround. 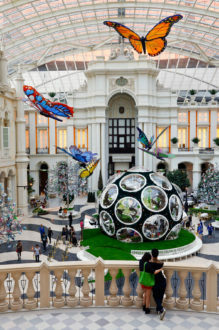 For ten years, Venue Arts also designed and implemented five seasonal change-outs for The Bellagio Resort & Casino’s very popular Conservatory Garden, including Christmas and Chinese New Year. Seasons. 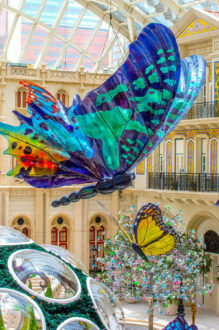 Across the globe, the Chinese government deemed Venue Arts’ Magic in Macau – Butterfly Pavilion installation the most successful event in the history of Macau, as it drew up to 2,ooo visitors daily throughout its eight-month exhibit. Whatever the creative direction, Venue Arts’ end-result is always memorable and superbly executed.